Come and visit Hairporium and receive a warm and friendly welcome from our staff. Our stylists are trained to a high professional standard and have experience in all aspects of Hairdressing for both ladies & gentleman. We are happy to arrange consultations to help you to choose the right style and colour for you and to discuss any further concerns you might have. 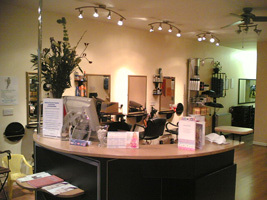 We also have our Beauty room where you can choose from a wide range of treatments. Millenium gel polish now available at our Salon. Got that special occasion booked? Why not book a complete hair & beauty package and leave our salon feeling like a million dollars. Take a look at our Beauty page to see the range of treatments that we have to offer. Click on our "Offers page" for our amazing promotions on both Hair & Beauty treatments. Why not purchase one of our Hair & Beauty vouchers as a birthday present. Values start from £5 upwards. Call into our Salon for more details. NB Please bring student ID card with you.